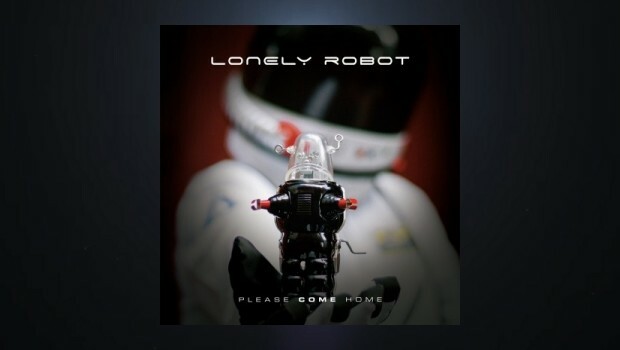 Lonely Robot is the new project from John Mitchell, a renowned progressive rock musician with an impressive career as guitarist, producer and vocalist with bands such as It Bites, Frost*, Arena, and Kino. His latest project has elements of many of these influences, showing his usual ear for song writing and strong guitar, along with the added emphasis on the musical dynamics more usually associated with film soundtracks. The science fiction concept running through Please Come Home is that some ancient civilisations, such as the Mayans and the Egyptians, appeared to have technology far in advance of what would have been expected at that time possibly due to extra-terrestrial intervention. Mitchell admits to be a fully paid up ‘geek’ with a love of retro sci-fi, but this is mercifully not a full blown corny sci-fi concept album. 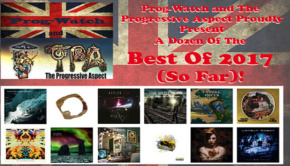 The themes and background story are suggested with a combination of melodic rock songs and cinematic soundscapes, rather than through an overtly literal narrative ie this is no modern day ‘War of the Worlds’. Airlock aptly opens the album with an instrumental tour de force worthy of the opening credits of any decent sci-fi film. Mitchell’s ominous guitar is perfectly complimented by Jem Godfrey of Frost* on keyboards building the sinister tension with simplicity and expertly placed chords that Mitchell hoped would ‘frighten children’. The sound of a baby crying as the song closes may imply that this Airlock is one we all go through at birth, or may signify re-birth for humanity as their extra-terrestial origins become more apparent. Mitchell is clearly enjoying himself on this project as he can explore areas that would probably not be so easily accessed with his usually more straightforward rock/pop oriented band It Bites. He also shows great confidence in his collaborators as he only gave Jem Godfey an outline of tracks Airlock and Lonely Robot, allowing Godfrey to interpret the piece for himself. Godfrey thankfully avoids what Mitchell describes as ‘widdly keyboard solos’ in favour of subtly adding atmosphere and drama to the music needed to complete the picture. 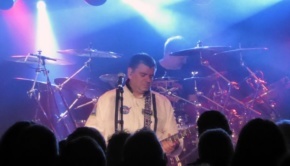 Out of the Airlock we are taken in to the power and menace of God vs Man, which allows Frost* drummer, Craig Blundell, a showcase for his dynamic drumming. This song points towards Erich Von Daniken’s book ‘Chariots of the Gods’ (1968) with it’s premise that humanity may have originated from extra-terrestrial visitors. The song dramatically speculates what conflict or catastrophe may occur if ‘The Architect’ returns. Mitchell’s under-rated voice is particularly effective as he goes through the changes from restrained vocal passages into much more powerful dramatic choruses. This is also the first time we hear the narration of actor Lee Ingleby who intermittently appears throughout in the background with spoken parts outlining the sci-fi thread running through the album, and underlines the feeling that this is partly a film soundtrack of an unmade movie. Freed from his usual band constraints Mitchell chose to work with a range of collaborators, some more surprising than others for his usual audiences, and this adds to the interest and diversity in this project. He has talked about his boyhood obsession with 80’s pop band Go West and uses the soulful baritone voice of their singer Peter Cox to sing The Boy in the Radio. This is possibly the most It Bites sounding song on the album with a catchy chorus and polished production. It Bites comparisons resonate later on straightforward driving rock/pop song, Construct/Obstruct, with insistent rhythm, slick guitar and robotic chorus. Mitchell wrote his first ever duet on the delightful Why do we Stay? Heather Findlay (ex-Mostly Autumn) contributes a tender, breathy vocal unlike her usual more folk tinged style. The delicate piano intro allows room for some of the most poetic lyrics, Floating high above the ground, I draw faces in the clouds. The song builds into a more rock oriented duet as Findlay and Mitchell’s voices combine so well and a finely judged guitar solo soars. The song fades away with the same touching piano, leaving a melancholy feeling that perhaps that approach could have been further explored on this song with more restraint – sometimes less is more. Catchy rock/pop song Oubliette is a collaboration of a more lightweight nature with another female singer, Kim Seviour from Touchstone, following on from her entertaining acoustic interlude with Mitchell at the Celebr8.3 Festival in 2014. 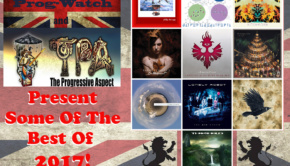 Steve Hogarth (Marillion) contributes delicate piano, harking back to his keyboard duties with former band The Europeans. Continuing Mitchell’s approach of using guests in unexpected roles, 80’s pop star Nik Kershaw contributes an unidentified guitar solo but no vocals. Much sought after Nick Beggs, player with Steve Hackett and Steven Wilson, adds his characteristic bass. Lonely Robot is a progressive song which initially takes an engaging conventional verse/chorus approach but midway through appears to lose gravity, floating away as we hear the plaintive radio mike call Can anybody hear me? The song then erupts in a blaze of powerful drumming and guitar spasms. Blundell’s touch and dexterity on drums is exemplary as he in turn moves from understated pop drumming, then gentle floating percussion and then into powerful hard driving rhythms. Quite rightly John Mitchell attributes considerable credit to the impact of Blundell’s percussive contributions on Please Come Home. A Godless Sea is largely instrumental with Godfrey’s Frost* input clear, and projects a cinematic scope akin to Terminal Frost by Pink Floyd. It is these moments that make Lonely Robot a much more beguiling project by John Mitchell as he stretches himself away from usual song structures and lyrical themes. The story and album climaxes powerfully with Are We Copies? Mitchell asks over an Arena like rock base as ‘The Architect’ returns Are we Human after all?. Human Being brings us back to earth on an optimistic note with an appeal for us to be more compassionate with each other, and to cherish our Pale Blue Dot framed by a trademark Mitchell emotive rock song with Hogarth’s distinctive backing vocals. The Red Balloon short coda to the album feels like the end credits to this unwritten film soundtrack as Mitchell’s warm voice over a simple piano floats away on the wind. Followers of Mitchell’s other projects past and present will find much to enjoy with Lonely Robot. 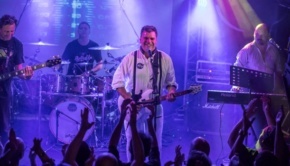 Appropriately it is Kino (German for ‘cinema’), his previous short-lived project with Pete Trewavas (Marillion) and John Beck (It Bites), which most resembles Lonely Robot in the desire to combine well crafted songs with more cinematic ideas projected on a wider musical screen. Kino effectively later transmogrified into a successful re-formed It Bites with emphasis on conventional more rock/pop oriented song writing, albeit with ‘proggy’ elements. In Lonely Robot John Mitchell may have found a more Kino like vehicle for a more experimental project fusing film-like soundscapes and melodic rock songs. Mitchell’s song writing ability is self-evident and well known, providing a very engaging base to the project. This high quality debut will hopefully embolden him to further emphasise the more unconventional and more intriguing progressive aspects on similar future projects.